MORE POWERFUL THAN STRATEGY, CULTURE, OR INNOVATION, DISCOVER THE ONE BUSINESS TOOL THAT IS THE ULTIMATE GAME-CHANGER. 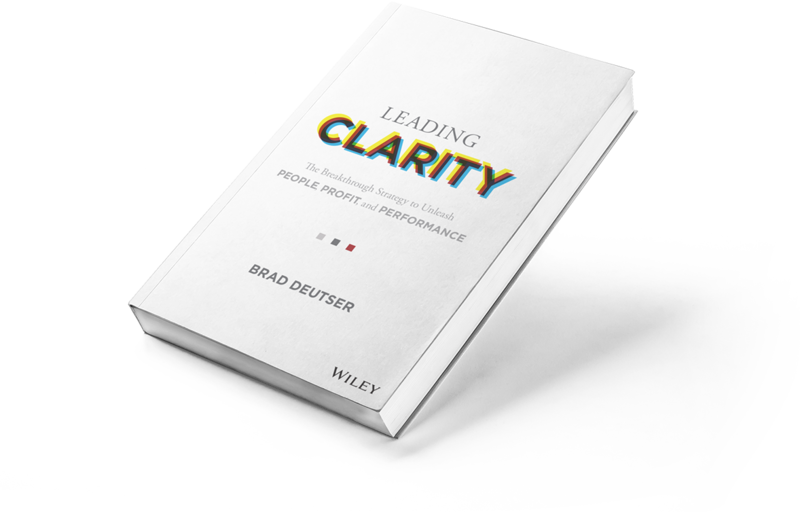 Leading Clarity offers a bold proposal that changes the trajectory of your business and leadership. Today’s business environment is more complex than at any time in history with greater ambiguity, chaos and uncertainty. Too often, individuals and organizations become bogged down with competing priorities and the constant press of daily demands. This tangled mass of noise effectively handicaps every facet of business. This book provides a proven, time-tested strategy that has brought dynamic results to hundreds of organizations of all scope and size. Informed by in-depth research conducted by the Deutser team, made up of business strategists, social scientists, organizational psychologists, innovation specialists and designers, the framework and methodologies presented will align focus and drive organizational performance. Lead teams and individuals with clear direction and purpose. Value inside the box thinking and innovation. Identify the impact drivers that keeps your employees happier, more engaged and performing at their peak. Infuse positivity into your organization’s DNA as a profitability catalyst. Founder of The Purpose Collaborative and Cone, Inc.